Flatness: The condition of a surface or derived (bắt nguồn từ) median (ở giữa) plane (mặt phẳng) having all of its elements in one plane is known as Flatness. Flatness is not the same as parallelism. Parallelism uses a datum to control a surface while flatness does not. Think of a table with two missing legs at an angle to the floor. The table top may be within flatness tolerance but would not be parallel to the floor. 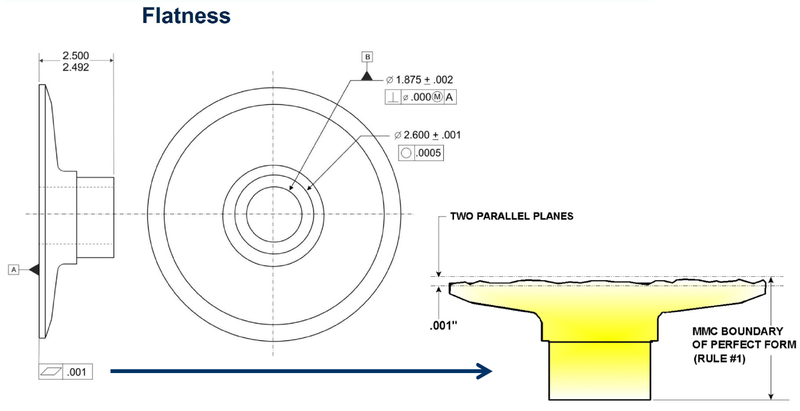 Applications used flatness tolerance: A real-world application of a flatness tolerance is to limit flatness deviation (độ lệch) on mating surfaces in a gasket joint application. When you want to constrain the amount of waviness or variation in a surface without tightening the dimensional tolerance of said surface. Usually flatness is used to give a surface an even amount of wear or for sealing properly with a mating part. Commonly used on a fixture that must mate flush with another part without wobbling, but where orientation is not important. 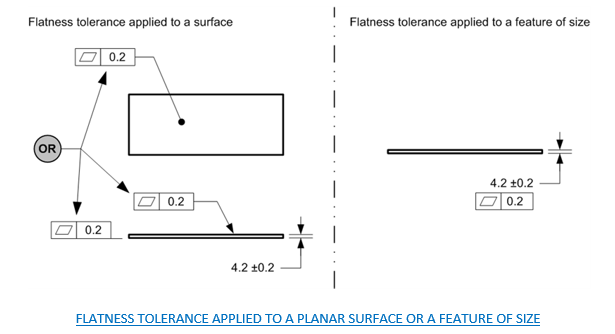 Flatness tolerance is applied to a planar feature: Where a flatness tolerance feature control frame is placed on a plane or surface (leader-directed to a feature or attached to an extension line from the feature) the tolerance applies to a single nominally flat feature. All the surface elements must be within two parallel planes (indicated with a flatness tolerance) apart. 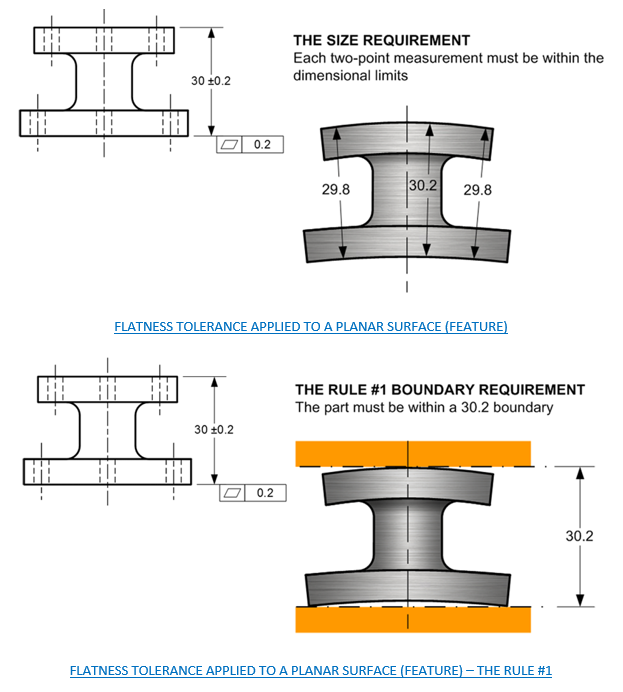 Each actual local size must measure within the flatness tolerance specified. The flatness tolerance do not overrides Rule #1. 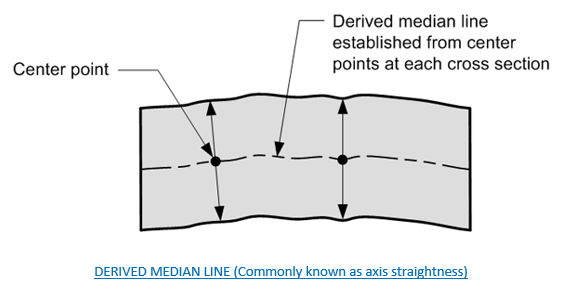 Flatness Tolerance: Specifies a tolerance zone of two parallel planes within which a surface or derived median plane must lie. 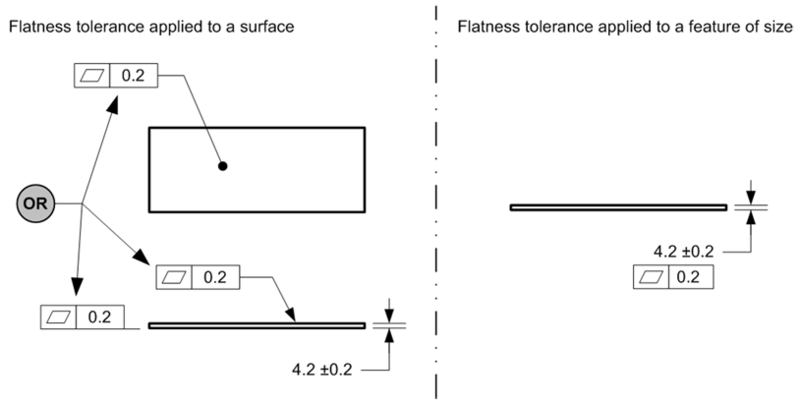 Flatness tolerances do not use different tolerance zones for surfaces and derived median planes (đường, tuyến được hình thành từ mặt phẳng). A flatness tolerance cannot control whether the surface is fundamentally concave, convex, or stepped; just the maximum range between its highest and lowest undulations. 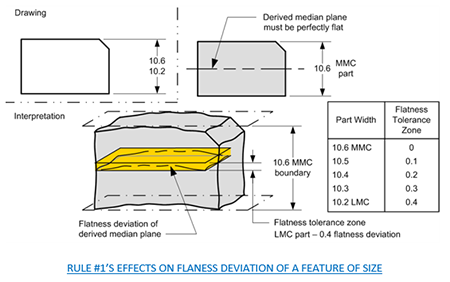 Flatness Tolerance Zone: A tolerance zone of two parallel planes within which a surface or derived median plane must lie. Flatness tolerance zone is the space between two parallel planes. Rule #1 effect on flatness deviation. When Rule #1 applies to a planar feature of size, it limits the flatness deviation of the derived median plane to equal to the size tolerance. Rule #1 effect on a flatness deviation of a surfaces. When Rule #1 applies to a surface, no flatness deviation permitted on both surfaces where the part is at MMC, maximum flatness deviation on both surfaces when part is at LMC. 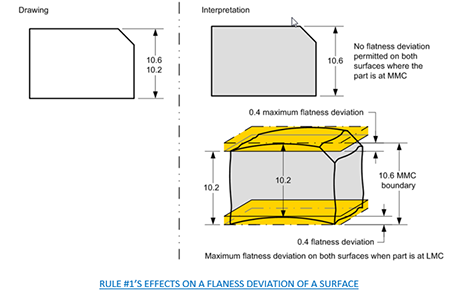 Determining Whether a Flatness Tolerance Is Applied to a Planar Surface or a Feature of Size Dimension. The location of the flatness tolerance indicates what it's applied to. Where the leader line of a flaness tolerance is directed to a surface, or attached to an extension line from the surface, it indicates that it applies to the surface (the tolerance applies to a single nominallyflat feature). Where a flaness tolerance is located beneath or beside a size dimension, it indicates that it applies to the feature of size. Derived Median Plane (mặt bằng tìm thấy từ điểm giữa/trung tuyến được hình thành từ nhiều đường phân đoạn) is the term for an imperfect plane formed by the center points of all line segments bounded by the feature of size. FLATNESS TOLERANCE APPLIED TO A PLANAR SURFACE OR A FEATURE OF SIZE? 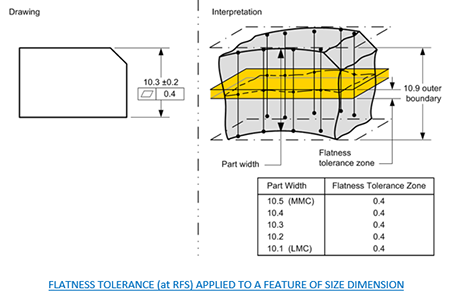 Flatness tolerance is applied to a feature of size dimension at RFS. The flatness tolerance is not applied to a planar feature. Each actual local size must be measure between 10.1 and 10.5 (See fig at RFS). The flatness tolerance overrides Rule #1. Flatness tolerance applied to a feature of size dimension at MMC. 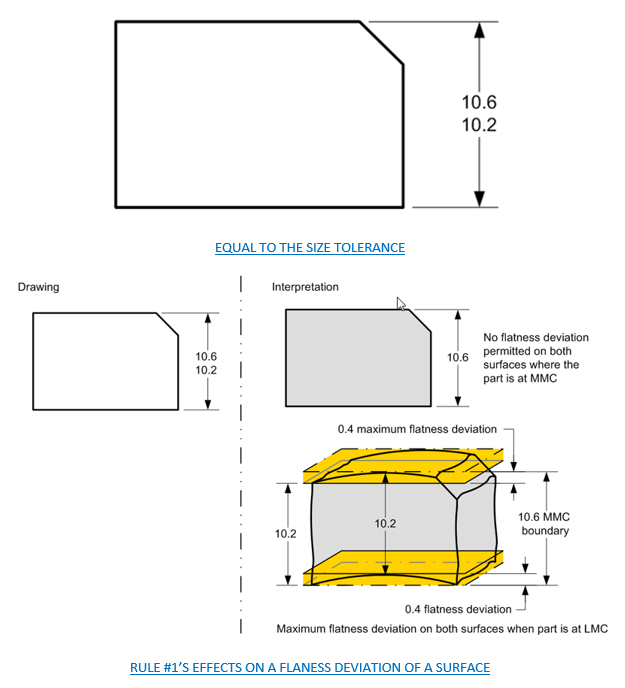 The flatness tolerance value may be greater than the size dimension tolerance. 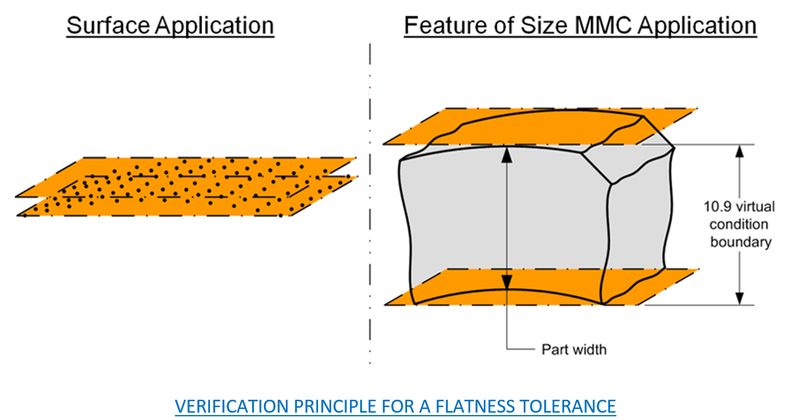 The flatness tolerance zone may be viewed as a virtual condition boundary. The flatness tolerance does not override Rule #1. Flatness tolerance applied to a planar surface. The size requirement: Each two point measurement must be within the dimensional limits. The rule #1 boundary requirement: The part must be within the feature of size boundary. Flatness Tolerance for a Width-Type Feature: A flatness feature control frame placed according to option (a) or (d) in (Table Geometric Characteristics and Their Attributes) associated with a width dimension replaces Rule #1's requirement for perfect form at MMC with a separate tolerance controlling the overall flatness of the width-type feature. Where the tolerance is modified to MMC or LMC, it establishes a Level 2 virtual condition boundary as described in (Level 2 – Overall Feature Form) and in Fig. 1a and Fig. 1b below. 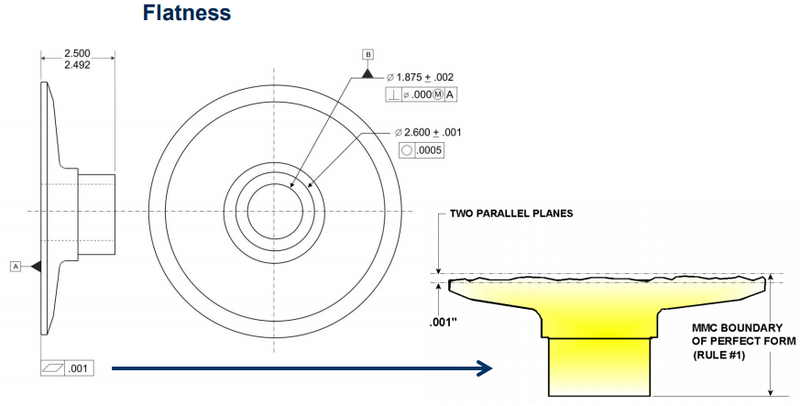 Alternatively, "the center method" described in (Level 2 Adjustment – Actual Local Sizes) may be applied to a flatness tolerance at MMC or LMC, but there's rarely any benefit to offset the added complexity. Unmodified, the tolerance applies RFS and establishs a central tolerance zone as described in (Tolerance Zone Shape), within which the feature's derived median line shall be contained. This application of a flatness tolerance is an extension of the principles of (Straightness Tolerance for a Cylindrical Feature). 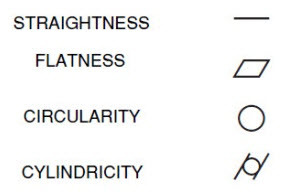 Y14.5 suggests an equivalent control using the "straightness" characteristics symbol. However, where strict adherence to Y14.5 is needed, then straightness symbol should be used. When verifying a flatness tolerance, the flatness deviation of the surface is the minimum distance between the two parallel planes that just contain all of the points of the surface. 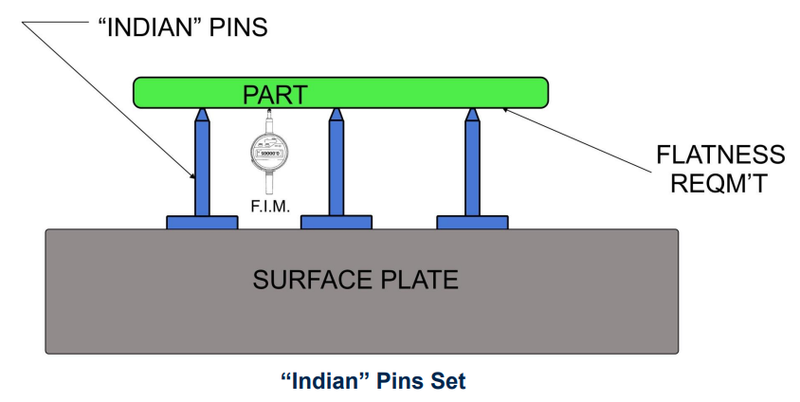 A common inspection tool for inspecting a flatness tolerance applied to a surface is a surface plate and dial indicator. 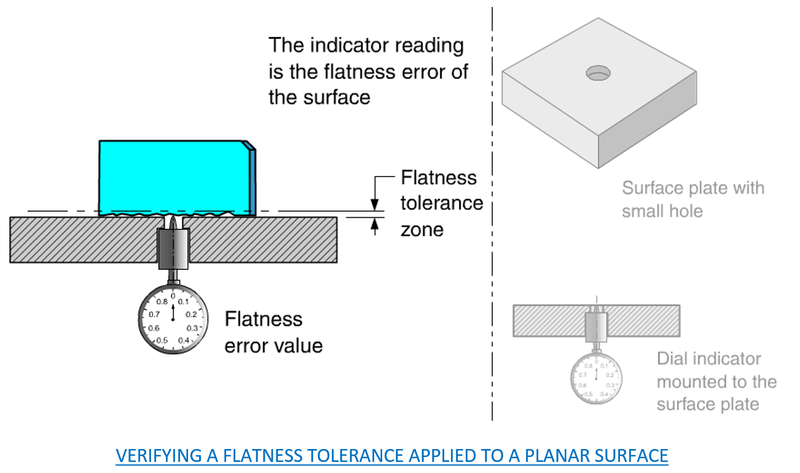 What is one requirement of verifying a flatness tolerance applied to a surface? A set of points must fit between the two parallel planes of the tolerance zone. 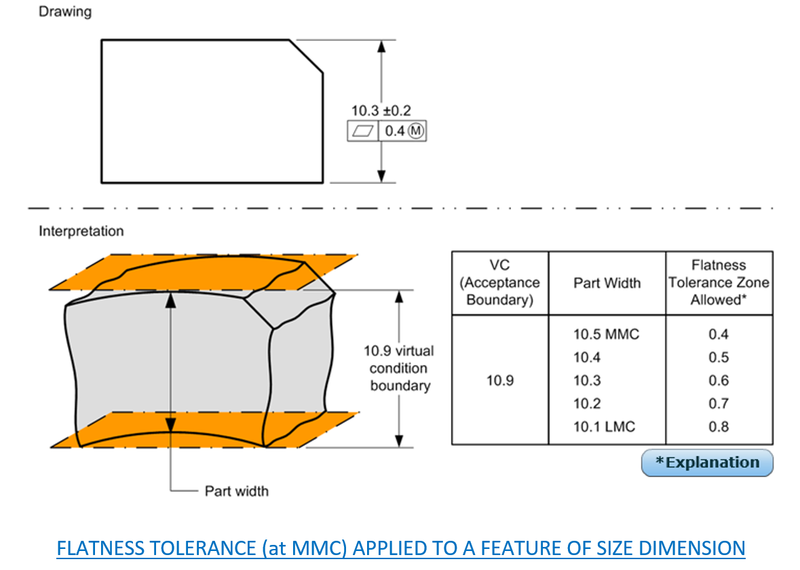 To verify/inspecting a flatness tolerance at MMC applied to a feature of size, the feature of size must fit through a virtual condition boundary. When should a functional gage be used to verify a flatness tolerance? Whenever a flatness tolerance is applied at MMC to a feature of size. Flatness measurement is a T.I.R (Total Indicator Reading) or F.I.M (Full Indicator Movement) that is achieved with a probe or dial indicator. 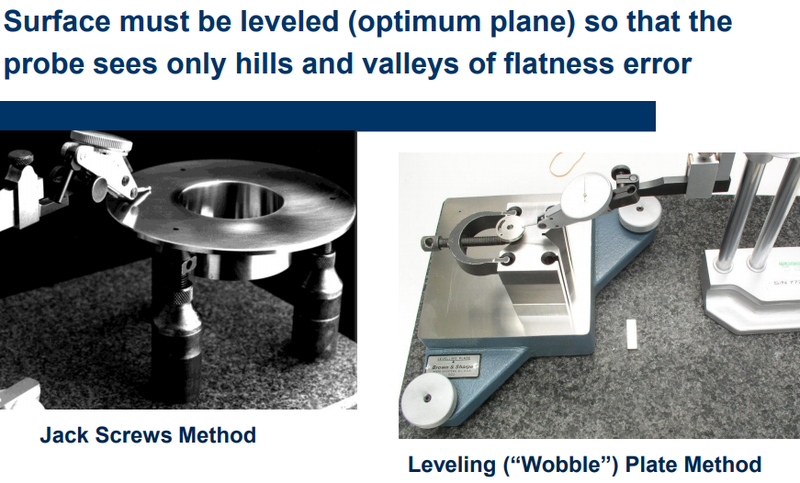 Surface must be leveled (optimum plane) so that the probe sees only hills and valleys of flatness error. Alternative is (3) Pins. Three pins at exactly the same height within millionths. The pins level the surface.